the main loop and main widget classes StelMainWindow and StelMainGraphicsView. Those classes have a single instance which is created at startup by the main() function. They perform various tasks such as the creation of the main program window and openGL context, the creation of the stellarium core, the creation of the GUI. After initialization, they manage user's input event propagation and event loop. There are heavily based on Qt features. a collection of StelModule instances which display the main elements of the program such as planets and stars. Each StelModule should be registered to the StelModuleMgr. Because many components of Stellarium derive from the StelModule class, it is possible for the main loop to treat them generically by calling their standard methods such StelModule::update() and StelModule::draw() at each program iteration. It also allows other program components to access them by name. StelProperty can be used to access all defined static properties (see the Qt property system for more information) of all registered StelModule instances. 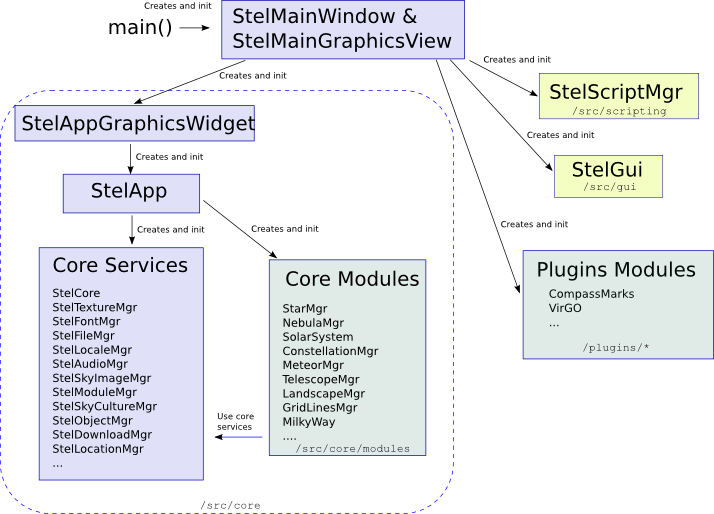 StelModule can also be loaded dynamically by Stellarium, which is the standard way of creating Plugins. StelAction instances can be used to define actions that can be triggered by the user through UI controls or key combinations. the Graphical User Interface (StelGui). It is based on styled Qt widgets which are rendered directly in the openGL window. Users actions can trigger signals which are connected to core and StelModules slots. Many UI controls can also be directly connected to StelAction and/or StelProperty instances to reduce the amount of boilerplate code required to link UI changes to the back-end modules and vice-versa.